The whiteboard in the office had been accumulating a "top 10" of bugs over the past weeks, and with QuickGene 1.2 we've had the opportunity to mark them as fixed — most of them reported by you! But that's not all that's new with the latest version of QuickGene. Upon reviewing user feedback, we noticed that there was an overwhelming demand for Smart Lists. 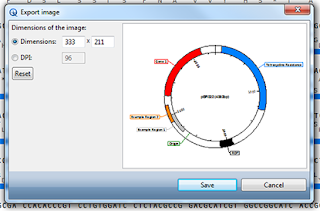 The Enzyme Manager now allows you to construct lists of enzymes dynamically by selecting various properties, including the producer, optimal reaction temperature or the maximum number of cuts in the current sequence. Whenever any of the properties change, the lists are automatically updated: a genuinely smart way of managing enzyme lists! A feature request last month described saving maps in high resolution or as vector files, such as Scaled Vector Graphics (SVG). It is now possible to specify the dimensions or DPI of PNG, JPEG, BMP, GIF and SVG files. Smart lists allow you to create dynamic lists of enzymes by selecting desired properties, such as optimal reaction temperature or the maximum number of cuts in the current sequence. A new dialog provides you with more control over the way your maps are saved as image files, and now includes support for scalable vector graphics (SVG). The lists of isoschizomers and compatible ends now show more information when clicked. Sequence tabs have a context menu to facilitate adding, renaming and removing sequences. Added user feedback while populating statistics table. Added a search box to the help pages. GenBank and Fasta files saved with optional QuickGene information could not be loaded in QuickGene. Recognition sequence could appear incorrectly when spanned over multiple lines. Connecting to the CrimsonBase server could prematurely timeout when checking for updates. Information icon was missing in enzyme tooltip. When searching, features would sometimes turn into search results or vice-versa. Features wouldn't show in map view when the label didn't fit. Tooltip in map view remained persistent. Some specific character entries could corrupt an XML file. QGProjects wouldn't load if their name was less than 10 characters long. View options were not scrollable on small screens.